#1 Live within your space. Most of us have heard the phrase “Live within your means,” or don’t spend more than you earn. But we often don’t realize that the same idea applies to our possessions. We should only keep what we have space for in our home/office. This is a harsh and somewhat unfair reality. Some may have a closet as big as a living room while others have a tiny shallow nook. Some may have a whole workroom for storing tools while others have only a few hooks on a wall. As tough as it may be to accept, you simply can’t be organized if you have more belongings than you have space to put them. Period. #2 Keep items for the right reasons. If you are ready to clear out some clutter (to abide by principle #1), approach the task with the right mindset. We often hold onto things for the wrong reasons. Remember: simply keeping an item does not honor the item itself or the person from whom it came. In fact, storing belongings that you dislike can create negative associations, so you are sacrificing space and efficiency just to make yourself feel badly. #3 Everything you own needs a home. Assuming you’ve culled your belongings to a reasonable amount, you must now designate a “home” for the possessions you keep. Every item in your space doesn’t necessarily need to be in its home at all times, but you need to be able to put it away. If you don’t know where something is supposed to go, you have zero chance of putting it there. #4 Stop cleaning up and start restoring order. Ever scurry around the house shoving stuff in drawers before guests come over? That’s cleaning up. The space looks nice, but it is completely disorganized. Perhaps you’ve been to a friend’s house and thought, “wow, they are so organized” because they don’t have anything out on the counters? Chances are if you opened a closet your might find a crowded mess. Organized doesn’t mean tidy, it means having things in the space you have intentionally decided is best for them. Instead of cleaning up, take time at least once a day to restore order. This simply means walking around and putting items back into the “home” from principle #3. Sure, on any given evening, you may leave a couple of things out because you will still be working on them the following day. But generally speaking, order is a state which you create and then maintain. If you do this daily (or more), the task will never seem daunting or take too much time. I know, if you have others in your space who haven’t agreed to restore order, this can be harder. But at least you can start with the spaces you control. 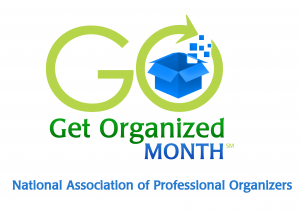 Getting organized isn’t a one-time project. It is a life approach that hinges on the belief that belongings are acquired to make our life better, not worse. It is a daily discipline that makes space a sanctuary where you love to be.